Updated February 16, 2016 – See the note at the end of this blog post about using the Nikkor 300mm f/4 PF VR lens with the TC14E III for photographing big-wave surfing and a true test of it’s autofocus capabilities. Over the last month, I have been testing out the Nikon AF-S 300mm f/4E PF ED VR lens, which was loaned to me by B&H Photo and Video for review. This lens has been incredibly popular and it is very hard to actually find one of these to buy as every time this lens becomes available they are sold out within 24 hours. The name for this lens is a mouthful, but the important bits are that it is a 300mm f/4 lens with the same fast AF-S autofocus on the much more expensive f/2.8 version of this lens. It also is a Phase Fresnel design, which is what the PF stands for. The Phase Fresnel technology is what really makes this lens stand out. It also accounts for how small this lens actually is. 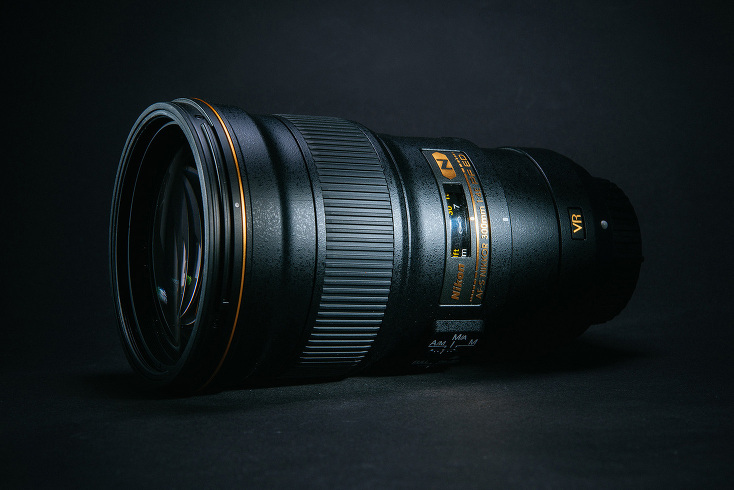 It is lighter than the AF-S Nikkor 24-70mm f/2.8 lens and only a few millimeters longer than that lens, making it the smallest and lightest 300mm lens on the market. What is Phase Fresnel technology? From the Nikon Website, “Phase Fresnel (PF) lens elements effectively compensate for chromatic aberration and ghosting when combined with ordinary glass lens elements. The PF lens element is based upon the Phase Fresnel lens, which appears to have a series of concentric circles engraved onto it. Utilizing a Phase Fresnel lens element allows Nikon engineers to use fewer lens elements, resulting in a more compact and lightweight lens.” As shown in the image below, this lens is incredibly small and lightweight for a 300mm optic. The 300mm f/4E PF ED VR incorporates the Nano Crystal Coatings found on all the modern Nikkor optics as well as an aspherical lens element and extra-low dispersion (ED) glass. It also includes a Flourine lens coating on the front element to repel water and oils. The VR moniker refers to Vibration Reduction, which works incredibly well with this lens. While all of this technobabble might sound confusing, the reality is that all of these features work together to make this lens one of the best Nikkor lenses I have ever shot with. Before we get rolling here, I’ll just say this: I didn’t send this lens back to B&H. I called them up and gave them my credit card number instead. I couldn’t even think about not having this lens in my arsenal. It is that good. From my testing so far, the Nikkor 300mm f/4E PF is incredibly sharp from corner to corner. Even wide open at f/4, it is sharp corner to corner, which is very rare in any lens. I’d say it is up there with the legendary 300mm f/2.8 Nikons as the sharpness I have seen out of this 300mm f/4 lens is as good or better than any of my other Nikkor lenses. I don’t have test charts or graphs to measure this but I am pretty sure it will be among the sharpest Nikkor lenses when DXOmark gets around to testing this lens. Of note, because of the Phase Fresnel design, there are some issues that can appear when shooting directly into the sun or when the sun is just out of the frame but still hitting the front of the lens. This is the result of the Phase Fresnel lens element which is created by using stair-stepped engraved concentric circles on one side of the lens element. From the Nikon website, “Due to the characteristics of a PF (Phase Fresnel) lens that utilizes the photo diffraction phenomenon, when there is a strong light source within the frame or when light enters the lens from outside of the frame, ring-shaped colored flare may occur according to shooting conditions.” In my testing, I never noticed this phenomenon. Even when photographing the full moon (as shown below),which was quote bright, I did not notice any ghosting or abnormal diffraction. If you plan to shoot silhouettes straight into the sun, then this may not be the lens to use. Regardless of this issue, the positives of this lens far outweigh this one possible problem. In the image above, I captured a series of five images and stitched them together in Lightroom using the Panorama feature. All of the images are shot at f/5.6 and were sharp corner to corner. I haven’t been blown away with the VR technology built into my current Nikkor lenses, like the AF-S 70-200mm f/2.8 VR, but the VR in the 300mm PF lens is nothing short of amazing. The image below shows just how good it is. This was shot at ISO 100 handheld using a shutter speed of 1/80th second and it is pin sharp. I am not the steadiest guy when it comes to handholding lenses at slow shutter speeds so that fact that I could handhold this lens at 1/80th second and get a sharp image is pretty impressive. If I were to shoot with the 70-200 at that shutter speed with or without the VR on, I would be guaranteed a fuzzy image. The Nikon literature states that the VR technology will allow you to shoot at 4.5 stops lower than you normally would be able to when shooting handheld. Seeing how the image below turned out at 1/80th second, I’d say they are correct. Normally I would not even consider shooting at anything lower than 1/1000th second with a lens of this focal length, but because of it’s small size and weight, and the incredible vibration reduction technology, going down to 1/100th or even 1/80th second for stationary objects is no problem. For moving subjects it will depend more on the speed of the subject than how low of a shutter speed you can handhold with this lens. There were some service advisories with this lens early on. Apparently, there was an issue when shooting with the D800 or D810 cameras where the vibration reduction didn’t work at shutter speeds around 1/80th second up to 1/250th second. I can say pretty decisively that this issue has been dealt with as the image above, shot at 1/80th second on a Nikon D810, clearly shows. I had no issues whatsoever in my testing with the vibration reduction not working as advertised. The lens has been out for over a year now, so it appears that whatever VR issues the lens had early on, Nikon has solved those issues. As with all of the latest Nikkor lenses, this one has the AF-S Silent Wave Autofocus Motor (SWM) built into the lens. I have found lenses with built in motors to focus much faster than the those without. After shooting with this lens for a month now, and having shot a fair number of moving subjects like deer and snowboarders, I can say that the 300mm f/4 PF has stellar autofocus. I’d say it is on par with the AF-S 300mm f/2.8 VRII lens, which has superb autofocus. I will have to keep testing the autofocus over the next six months or so to know just how well it does in a variety of conditions but so far I am very impressed. The autofocus accuracy is extremely good as well. Even in tough conditions like the snowy image of the frosted trees shown below, the lens was easily able to lock onto the tree trunk while it was snowing heavily. I have not had to make any AF Fine Tune adjustments to my Nikon D810 with the 300mm f/4E PF and the autofocus seems dead-on accurate. It remains to be seen if this lens will be able to keep up with surfers on a wave, but from what I have seen already I have little doubt that it’s autofocus will have any trouble keeping up with surfers. 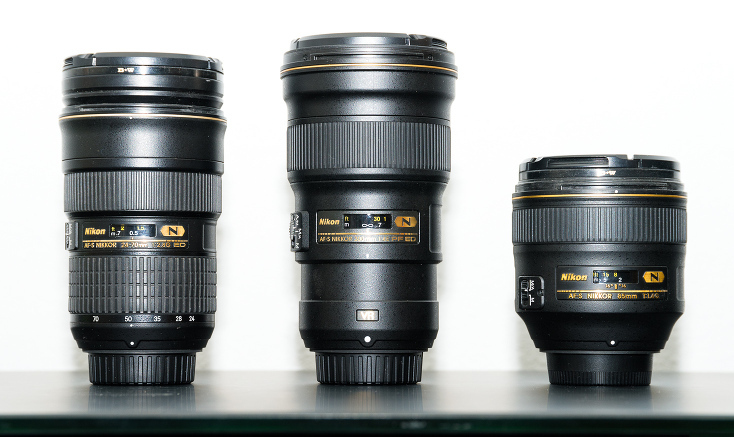 As with a good portion of the Nikkor “gold series” lenses, which are their top-end lenses, the 300mm f/4E PF is clad with a very hard resin outer shell. The 300mm f/4E PF uses the same outer shell materials as my other Nikkor gold series lenses and they have held up very well. This lens looks like it can take some serious abuse. It also has a rubber gasket on the lens mount, which helps to keep water out when shooting in rough weather. The focus ring is also perfectly placed and your fingers naturally fall right where the focus ring is located. The 300mm f/4 E PF does not have a tripod collar built into the lens. One is available but honestly, you won’t ever need it because the lens is so light it is like shooting with your 24-70mm lens on a camera. The lens feels comfortable in the hand when attached to both my Nikon D4 and D810. The lightweight nature of the lens makes it incredibly portable and usable in a variety of situations where I would not think of using a 300mm lens. It is also so light that leaving it attached to a DSLR and carrying it around all day is easier on the body than any of my f/2.8 zooms, all of which weigh more than this new 300mm lens. This new 300mm f/4E lens is also a new design that incorporates an electronic diaphragm. Because of this design, it is only compatible with newer Nikon digital cameras from 2007 forward. Even in tough snowy conditions, as shown in the image above, the 300mm f/4E PF did just fine. Of note, the autofocus did exceptionally well in these tough conditions where it was snowing quite heavily and it was difficult to pick out the tree trunk that I wanted to focus on through all of the falling snow. One of the big reasons I was interested in this lens is that it is so light, agile and incredibly sharp. I have tested it out using the AF-S Teleconverter TC-14E III, which is a 1.4X teleconverter and makes this lens a 420mm f/5.6. The autofocus speed still seems quite fast and accurate with the 1.4 teleconverter, which makes this lens incredibly versatile. My big reason for testing this out is that I can use the Nikon D810 in DX mode, which applies a 1.5x crop factor, making the 300mm f/4E mated with the 1.4x teleconverter combination a 630mm f/5.6 lens, all of which weighs only four pounds total! That means that for photographing surfing I can leave behind the massive tripod and shoot handheld with a 630mm lens that weighs only four pounds, still has excellent autofocus and also has vibration reduction. And with the Nikon D810, I can shoot at 7 frames per second (fps) with the MB-D12 battery grip attached. This combo will be a revolution in terms of traveling with a long lens and also in terms of freedom while trying to capture a fast-paced sport like surfing, skiing or mountain biking. Well, let’s put it this way, from the time I first shot with this lens I knew there was no way I was sending it back to B&H. This Phase Fresnel version of the 300mm f/4 is by far the most amazing Nikkor 300mm lens I have used. I have owned previous version of the Nikkor 300mm f/4 (all of which felt lacking in some way or another) and I have used several versions of the 300mm f/2.8 Nikons, which are absolutely amazing but also quite heavy. It seems that Nikon has finally gotten the 300mm f/4 right, and even better it is so small and lightweight that I can carry it as a standard lens along with my 14-24, 24-70 and 70-200mm f/2.8 lenses. The other fact I want to make very clear here is that this lens is so small and lightweight that you will actually carry it with you. It will always be one of my main four lenses that I take on every assignment now. Because it is so lightweight, I will end up shooting with it more often than I did with any lens I have ever owned that was longer than 200mm. It fits vertically into my camera bag, which means it takes up the same space as my 24-70 or my 14-24. In comparison, my 70-200 has to lay horizontally in just about all my camera bags and takes up a ton of space. The 300mm f/4E is so lightweight that I will be taking it as one of my two lenses when I hike across the Patagonia Ice Cap next month along with a 24-105 mm lens. The size and weight make this the most usable telephoto lens I have ever owned. With fast autofocus, crisp and amazingly sharp images, and the best implementation of Vibration Reduction I have seen on any Nikkor lens the AF-S 300mm f/4E PF ED VR is a winner. If you are looking for a 300mm lens, and don’t necessarily need the extra stop of light offered by the 300mm f/2.8, then this is the lens for you. I cannot recommend this lens highly enough. I have previously owned the Nikkor AF-S 200-400mm f/4 VRII lens and I have shot with previous 300mm lenses (both f/4 and f/2.8) as well as the new 80-400mm Nikkor lens. I have also shot a fair bit with my Nikkor AF-S 70-200mm f/2.8 VRII and the TC-14E III 1.4x teleconverter. The image quality offered by the 300mm f/4E PF lens is equal to or better than all of these options. Even with the 1.4 teleconverter, the 300mm f/4 PF is better than these other options in terms of image quality. Don’t get me wrong, the Nikon 200-400 was a great lens. I loved it for it’s versatility. And it was sharp but the autofocus wasn’t as fast as I would have liked when using it with a 1.4x teleconverter. It was also a huge beast of a lens, especially when compared to this lightweight 300mm. The 200-400 might have been a bit more versatile than the 300mm lens, but the small compact size of the 300mm PF lens more than makes up for any versatility factor. And the fact that I can use the DX cropping in my D810 along with the 1.4x teleconverter to get a handhold-able 630mm lens that weighs only four pounds is incredible. If the autofocus proves to be as good as I have seen so far, for sports like surfing, this lens will be a revolution for my work. For more information or to purchase the Nikon 300mm f/4E PF ED VR lens, click on the link to go to the B&H website. Update – February 16, 2016: After using the Nikkor 300mm f/4 PF VR for shooting surfing I can now say that without a doubt it is up to most any task where it needs to follow-focus fast action in Continuous AF mode. Over the last few days, as can be seen below, I have been shooting big wave surfing on the north shore of Oahu with the 300mm f/4 PF lens along with a Nikkor TC14E III 1.4x teleconverter and my Nikon D810 DSLR. With this combo and using the DX crop mode the lens is a very handholdable, lightweight 630mm f/5.6 lens. The autofocus performed quite well, especially in well lit situations. In dark or very low contrast situations this combo might be pushing it a bit for extremely fast action but for those situations you can take off the teleconverter to gain the best possible autofocus speeds. I think it will be even better with the new Nikon D500 DX camera body, and I am very excited to try that out when it becomes available. For those situations when you need more than 600mm or you have to shoot in low light, where using a full frame sensor would be critical for low noise at high ISOs then the Nikkor 600mm f/4 or the 500mm f/4 is still the way to go. But for 95% of the shooting I do, the 300mm f/4 PF VR lens is a phenomenal lens. After using this lens for a few months now, having hiked with it across the Patagonia Ice Cap and now, having shot surfing with it for a few days here in Oahu, this is the most exciting Nikkor lens I have added to my line up in quite some time. When you pick it up, the weight, or lack thereof, is shocking. Well done Nikon. This one is a gem and it has quickly been added to my mainstay lenses. Great review thanks! I recently aquired the Nikon D500 and was looking for a lens to take on my first trip to Africa. I’d previously rented the 500 f4 (Canon) for an Alaska bear trip and it was great. However, just transporting the lens around was a real pain. I ended up buying the Nikon 80-400mm lens but on the D500 and even the D810, it didn’t seem that great. My Sigma 120-300mm f2.8, (my other option) was a little better than the 80-400mm but the Sigma is still a heavy lens. Based partly on your review of this 300mm f4 lens, I bought one yesterday and WOW! It is incredibly sharp…probably better than the Sigma 120-300mm f2.8 (adjusted with lens dock!). Kills the 80-400mm. I screwed on the TC1.4 III this morning and it’s still amazingly sharp! On the D500, the autofocus flies, and doesn’t appear to be any slower with the 1.4x converter. I took some distant shots with the 300 f4 + 1.4x converter at both max aperture (f5.6) and stopped down to f8 and there was the tiniest improvement only…barely perceptible! Hence the D500 + Nikon 300f4 + TC1.4 III at f5.6, (630mm zoom!!) appears to be a winning combination. I don’t do birding but I’d say this would perfect for this as well. Michael Clark - Thanks Peter – sounds like a great combo. Can’t wait to try that out for Surfing and other far off sports. Sonal Malhotra - Thank you for a wonderful review- tempted to get this lens- did you try other higher teleconvertes like the 1.6 or 2.0? Michael Clark - No, the 1.7X and 2X teleconverters only work well with the Nikkor 300mm f/2.8 and 400mm f/2.8. Those teleconverters work with quite a few lenses, including this 300mm f/4, but the autofocus is quite poor. Mathew Joseph - As a prolific bird photographer who shoots on the move, the D500 + 300 mm f/4 PF VR lens is a fantastic combination that rarely misses the shot. It travels with me everywhere I go, and has got me some great bird images. Without hesitation, I would say that this combo is the best for birds in flight than any other in existence today. I have the TC 1.4 iii, but the autofocus takes a big hit. I use this hand-held, and even the f/4 fully open is ultra sharp for a fair amount of cropping. My poor D810 stays at home along with the longer focal length (but heavier) lenses! That seems to say that, in your experience, the PF yields equal or better image quality than a Nikon 300mm f2.8 ? And with a 1.4x it is better than a Nikon 300mm f2.8 with 1.4x ? Is that right? If so, that would be extremely impressive. Can you confirm that’s what you meant ? Michael Clark - Jakob – Hello. I can confirm that those were my findings. I would suggest renting it for yourself and seeing what you find. BTW, I also had an older 300mm f/2.8 so that may not be true if you have a newer one.